mirror we’ve got this great glow, beautiful lipstick, but what about our skin? What if I told you there’s a tool that can actually plump from within, that can add volume to your skin? This tool is Silk’n FaceFX. Let’s see what millions of users all around the globe are raving about. 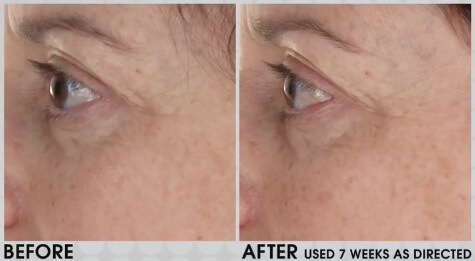 It is a FDA cleared device, clinically proven to guarantee results around the periorbital area to help plump and diminish not just fine lines and wrinkles, but those deep lines and wrinkles. What I love about Silk’n is that they make the big medical devices that you are seeing at your doctor’s office or your estheticians office, suitable for home use. You’re going to have your skin make its own collagen. You’re going to use red light therapy as well as the power of thermal heat to create your own collagen. It feels good but more importantly, it works amazingly! This is the only product that can do what my skin used to do 20 years ago, which is make more collagen. 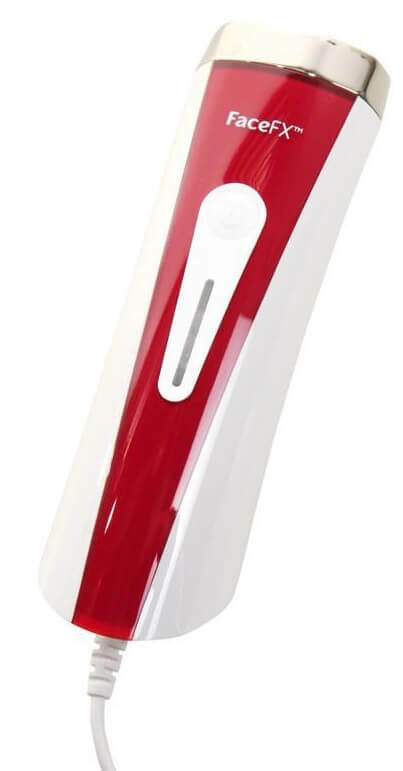 That’s why this truly is number one awarded device around the entire globe because you are not only getting red light therapy benefits but this device actually combines deep thermal heating with 24 light emitting diodes, the most of any other at-home device in the market. I want you to think about all this amazing skincare that you’re using right now and I want you to go deeper. If you want your products to work better for you, if you are looking in the mirror and you’re saying “you know what, I keep putting stuff on, I’m not really seeing much of a change, what do I do next”, I want you to start working from the inside out and that’s exactly what you’re going to do with your FaceFX. This does what no other beauty cream or lotion can do. What this light therapy is doing, why do we need red light? Light therapy has been trusted by medical professionals for the past thirty years. You need it for all-over skin rejuvenation. So it may be the fine lines and wrinkles, it may be the enlarged pores, maybe it’s skin tone. Do you have sun damage, do you have age spots, do you have uneven texture? If you’re touching your face right now and it is not baby soft, you need to be getting this today. 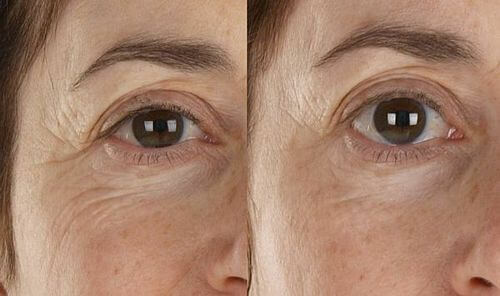 It is improving the look of the fine lines and wrinkles and the skin tone in the most delicate area on the face. This is really important because a lot of devices out there will tell you stay away from the eye area and I’m saying but that’s where I need it the most. What FaceFX is doing with that deep thermal heating is it’s going in, it’s warming the skin to those optimal temperatures, creating an invitation for that red light to go deeper than ever before. What happens when the red light goes beneath the skin? It actually ignites the energy sources within your very own collagen, their fibroblast and when we wake them up, we tell the body let’s promote, let’s increase. You actually have all of that collagen lying underneath the skin broken down as you age. You’re gonna wake it up, you’re gonna plump it up. So if you are looking for volume, do not look further. Not only does it do an amazing job but it feels fantastic. This is actually a treatment that you’re going to look forward to doing. Click here to buy + free shipping! Many of us have had red light therapy done before, many of us have had laser done before, many of us have tried a lot of different things to increase volume in our skin. We buy a lot of creams and lotions and potions that help topically on our skin, which are great, don’t stop using those. But when you have your skin make its own collagen and those are our building blocks of your skin, that’s what makes your skin look plump, that’s why when you look at someone young they don’t have lines and wrinkles because they have a lot of collagen. That’s basically the structure of your skin. So as we age, we don’t have as much. What’s nice about FaceFX is it is setting the perfect area for your skin to make more, to make itself act like it’s younger. When you apply red light therapy and you add heat that helps circulation in the eye area, nose to mouth, wherever you’ve got those deep lines, you’re gonna see remarkable results. I really want you to look at some of these before and after pictures. That hooded eyelid is absolutely gone. When you use it around that periorbital area, you’re going right up and on that brow bone so you get that lifted effect. See the lift to her hooded eyelid, look at the space, look at the difference. Opening up that eye area is such a game changer when it comes to reversing those signs of aging. 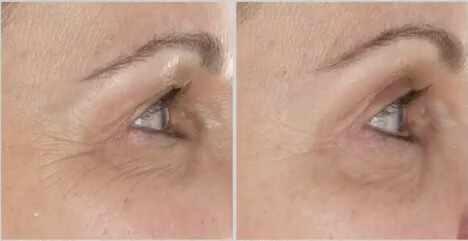 Because as your eyelid starts to come down and you increase those fine lines and wrinkles in that crow’s feet area, the eyes have a tendency to start looking a little squinty. You’re gonna go in and open that back up. It’s so easy you can not mess this up. Everybody can use this, any skin tone, any skin type, any age, men and women. Guys absolutely love these too. When you get it home, you’re just simply going to plug it in, it has one plug. This is sustained energy, this is a professional system, one button turns it on. You can’t mess this up. As soon as it comes in contact with your skin, it illuminates. Take a look at this picture. Here’s where this device becomes completely different than anything and everything you’ve ever used. Look at the depth in which that red light is traveling – the entire thickness of the fingers! I want you to think about that on your face. I want you to think about changing the game and working from the inside out – plumping, firming, minimizing those pores, smoothing out those fine lines and wrinkles and that is long-term. It’s not like it’s gonna go away, it’s not like it wipes off like mascara. So once it’s there, it’s there! Then you just maintain it. Use it maybe once or twice a week. This tool is my key anti aging device time and time again because it works for me. What I love about FaceFX is that results never go away. The more you use it, the more you get. This is something that a cream or serum can’t do. You can go to a doctor’s office and have red light therapy done there. But you’re have to buy a whole bunch of sessions. Here you buy this device, you own this device and you use it when you wan to. I’m obsessed with this item. Once you have this at home, you are never going to be able to ever part with it. And your skin gets tight. I use it at night because I love that when I wake up in the morning, I almost look like I have a new skin. If you’re looking for that glow without using a zillion highlighters that you have to wash off at the end of the night, if you’ve lost that glow, you’re going to get that back with this. If you have uneven skin texture and your skin is bumpy and it just does not feel good, you’re gonna get smoothness. If you are looking at your skin and you’re saying it’s uneven and if I don’t put on a ton of foundation my skin doesn’t look even, my skin tone doesn’t look even, guess what, this device is gonna take care of that. That is why I consider this my little miracle worker! Back to the best anti aging devices! Best Hand Cream For Aging Hands – Repair Your Hands! Hi, welcome to my blog. I'm Fiona. I'm a licensed aesthetician and certified laser technician with almost 15 years experience in the dermatology. My life-long passion is making people look good.